So it’s time to come back after long holiday break and I decided to come back with a musician new to my favorite list and the one who was my companion today=) I knew his music before, but only now noticed who was making this music and was fascinated by that person. Surprisingly he is also partly from country where I’m residing right now – Denmark! So here we go, introducing to you Matthew Santos! 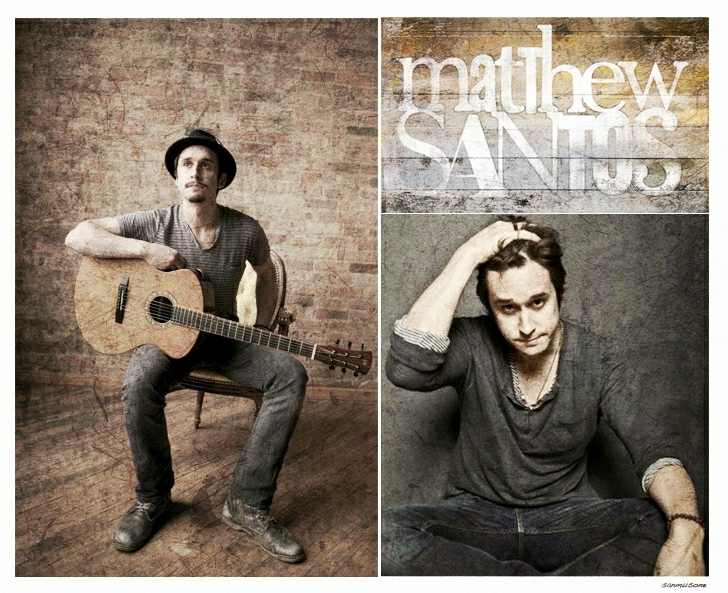 Matthew Santos is an American, Grammy nominee, rock and folk singer-songwriter, musician and painter. He was born on December 28, 1982 in Minneapolis, Minnesota. His mother, Judy, is from Denmark and his father, Dave, is of Filipino and Spanish descent. Santos discovered his passion for music at age six when he started playing piano and his inspiration for playing guitar began at the age of fifteen. At first Santos pursued the visual arts, but decided to dedicate his life solely to music so he moved to Chicago in 2001 to study music composition at Columbia College Chicago. Santos released his album Matters of the Bittersweet in November 2007 under indie-label Candyrat Records. Following the release of the album, he developed a following surrounding his video performances on YouTube. His five-piece band includes Aviva Jaye (vocals, keyboard), Robert Tucker (drums), Graham Burris (bass), and Matthew Nelson (keyboard). In 2006, he was featured on Lupe Fiasco’s Food & Liquor album on the song “American Terrorist.” He was featured on three additional tracks on Lupe Fiasco’s The Cool, released in December 2007; “Superstar”, “Streets On Fire”, and “Fighters.” Matthew is best known for his collaboration with Chicago native Lupe Fiasco on the single “Superstar” where solely his voice makes this whole song so amazing to me. After these tracks, he joined Lupe on world tour which included performances on many shows, such as Ellen DeGeneres, Jimmy Kimmel and many more. In 2009, Santos was featured in the single “Chaconne” by Twin Cities hip-hop artist Dessa, a member of Doomtree and year after that he released the album“This Burning Ship of Fools.” In 2012, January 31st Santos is releasing his newest album, “Quickly Disappearing”, which I am so excited about. His unique voice is truly luring in and capturing attention from first notes. To me his new song “Quickly Disappearing” and few others resemble Brian Adams a bit and I used to be big fan of him back in the day. Matthews voice sounds soulful, meaningful and deep. He seems to be old wise soul that’s expressing itself through music. It’s easy to loose yourself in his various and interesting music ideas, that go so well with that captivating voice. Santos creative soul shines in every single of his songs. Love at first note and his music was exactly what was missing on my playlist right now. If you think you’re becoming a fan too (which you should!) then visit his website, Facebook, Twitter, MySpace and LastFm for more. Also visit iTunes and Amazon for his beautiful music. The decision to pursue music was codified when he relocated to Chicago in 2001 to study music composition at Columbia College. After a few years serving coffee, walking dogs, scrubbing toilets, moving furniture, and pursuing his studies at Columbia, Santos dove head-first into creative experimentation. He started a band and hosted what became a legendary, cultural melting pot of an open mic night at Gourmand, a coffee house near campus that exploded every Thursday with an mind blowing line up of talent – everything from bag pipers to singer/song writers, slam poets to sitar players. Inevitably, Santos dropped out of school and took a soul-searching trip into the deep wilderness of Alaska.